The idea behind the blended beef-mushroom burger is that mixing chopped mushrooms into our burgers boosts the umami taste, adds more moisture and reduces the amount of beef needed. And reducing the need for beef has a big impact on the environment. Come Monday, though, two new items on Sonic's menu will make that leap. They're blended beef-mushroom burgers, a food that the institute has boosted through its "menus of change" initiative. According to the institute, this is the kind of menu change that's "a powerful, and previously underappreciated, way to drive improvements in our health and our planet." The idea is that mixing chopped mushrooms into our burgers boosts the umami taste, adds more moisture and reduces the amount of beef required for a burger. And reducing the need for beef has a big impact on the environment. According to the World Resources Institute, if 30 percent of the beef in every burger in America were replaced by mushrooms, it would reduce greenhouse emissions by the same amount as taking 2.3 million vehicles off of our roads. Sonic, though, isn't stressing the saving-the-planet angle. In a press release, the company's vice president of product innovation and development, Scott Uehlein, said that its new blended cheeseburgers, which contain 25 percent mushrooms, will "deliver the juicy savory deliciousness you expect from a burger in a way that makes you feel like you're getting away with something." The company promises that people eating the burger will get all this flavor but "none of the guilt" but does not reveal whether the guilt reduction will come from cutting calories or greenhouse gas emissions. Richard Waite, from the World Resources Institute, is thrilled. "I think it's great!" he says. 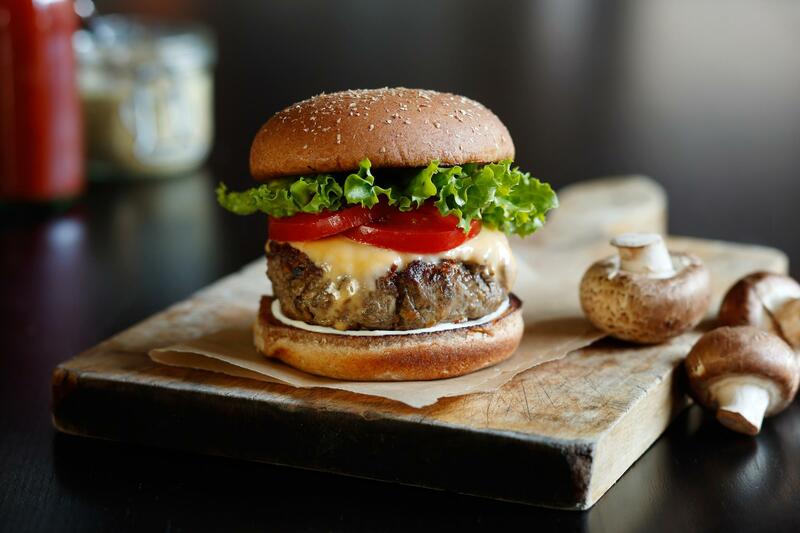 WRI has been pushing the blended beef-mushroom burger as a candidate to become one of America's most-served menu items, which WRI calls "power meals." According to Waite, the list of the top 20 meals served by food service companies currently contains only one plant-based item, a veggie wrap. The rest are meat-centric, including four versions of the classic hamburger. Many niche burger makers and school cafeterias have joined the blended burger bandwagon. In the dining rooms of Stanford University, Waite says, it's the only kind of burger you'll find. But Sonic's 3,500 drive-in restaurants represent a huge boost to the concept.